We have a new monthly feature called the Crime Corner. 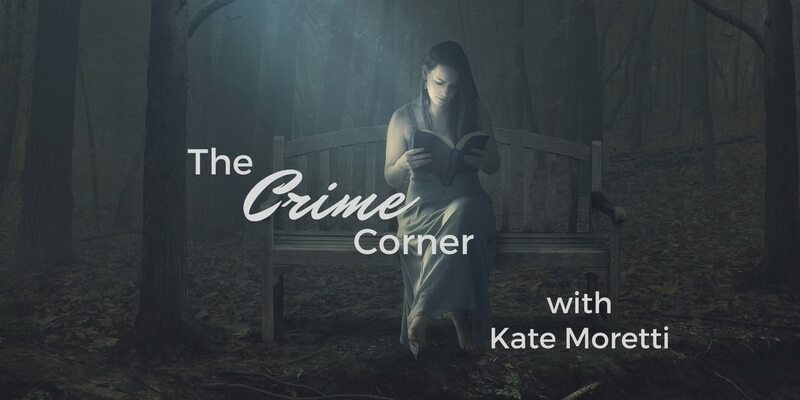 Kate Moretti, author of THE VANISHING YEAR and THE BLACKBIRD SEASON will interview the month’s most talked about crime/suspense/thriller authors! 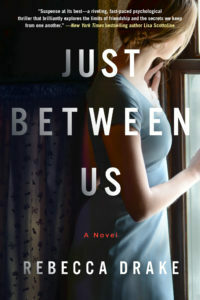 This month on the blog, we interview Rebecca Drake, author of the newly released JUST BETWEEN US. Kate: Tell us about JUST BETWEEN US! What was the inspiration to write it? Rebecca: Just Between Us is about four female friends—Alison, Julie, Sarah, and Heather—busy working and raising kids in an idyllic Pennsylvania suburb. When Alison spots a nasty bruise on Heather’s wrist, she shares her suspicions with Julie and Sarah, compelling all three to investigate what looks like a violent marriage. As mysterious injuries and erratic behavior mount, Heather can no longer deny the abuse, but she refuses to leave her husband. Desperate to save her, Alison and the others dread the phone call telling them that she’s been killed. But when that call finally comes, it’s not Heather who’s dead. In a moment they’ll come to regret, the women must decide what lengths they’ll go to in order to help a friend. My inspiration for the novel came from a comment made by a friend, who in expressing loyalty to another mutual friend, said he’d hide the guy in his house if he committed a crime. I was really intrigued by this comment and that, coupled with my own close friendships with some women in my neighborhood, sparked the idea for this novel. I was interested in exploring the way women communicate with and about each other, and with asking that question—how far would you be willing to go to help a friend? Kate: Particularly for writing thrillers, pacing seems to be a major sticking point for both writers and readers. How do you manage to walk the line between in-depth character development and a swift pace that moves the plot along? Rebecca: I love fully developed characters, but I also love fast-paced plots and I’ve never felt that I should have to sacrifice one to achieve the other. Of course, it can be tricky to make that work. I think it starts with really knowing the characters, so that I’m in their heads and can bring them to life in a way that makes readers relate to them. And then I have to use the staples of suspense—such as plot twists, cliffhangers, and misdirection—to keep readers turning the pages in order to see whether the characters will survive their particular dire situation. When I’ve finished a draft, I try to go through it like a reader, noticing any places where I started to skim and either changing or deleting those scenes. Sometimes it’s really hard to cut scenes, because you’d love to spend more time with the characters in their ordinary lives, but my job is to entertain and I take that seriously—I never want to bore readers. Kate: Age old question: plotter or pantser, and why? Rebecca: I’ve always been a plotter—I like organization and making lists, charts, etc… I’ve got a whiteboard in my office with the three-act structure depicted as a grid and I copy plot points on to sticky notes so I can move them easily around the board. But lately, I’ve become more hybrid, plotting only the major turning points before pantsing it. My background is in journalism, and I was taught that you have to be careful about over-preparing for interviews. While it’s important to do your research and have a list of questions, you need to be open to following up on something wholly unexpected that an interviewee says, because great stories often come from the unexpected. I’ve come to discover that writing fiction is very similar in that way. It’s good to have some sense of direction, even if the map only exists in your head, because you can waste an enormous amount of time chasing rabbits, but you learn things about characters as you write, and you’ve got to feel free to pursue the unexpected discoveries. For instance, when writing my first published novel, I knew from the outset that my detective character was dealing with some personal setback, but I didn’t know until two-thirds of the way through what he was grieving. When he revealed what it was –and it does often feel like a reveal, as if you’re simply recording what you see or characters tell you—it changed my planned ending. I could have forced him to follow what I’d originally plotted, but that would have been a mistake. Of course, pantsing means you have to go back in subsequent drafts to make the discoveries work, but the story is often better for it. In JUST BETWEEN US, what was your biggest challenge from a craft perspective? My biggest challenge in writing Just Between Us was using first person. It’s the first time I’ve written in first person and I chose not one, but four different first-person female POVs. That’s the way I initially heard the main character, Alison, speaking and I went with it, thinking it would probably be easier than third person. Wow, was I mistaken! I usually write multiple POVs, so it’s easy for me to distinguish between characters, but it was much harder making those differences clear to readers in first-person. I had to make sure that the characters’ speech patterns were distinct yet similar—so they sounded the way that close friends and relatives do who share a common vocabulary and phrasing. In addition, I asked my publisher to add each character’s name as page headers for their chapters, because I wanted to avoid any possible confusion for readers. Early readers have told me they love that! 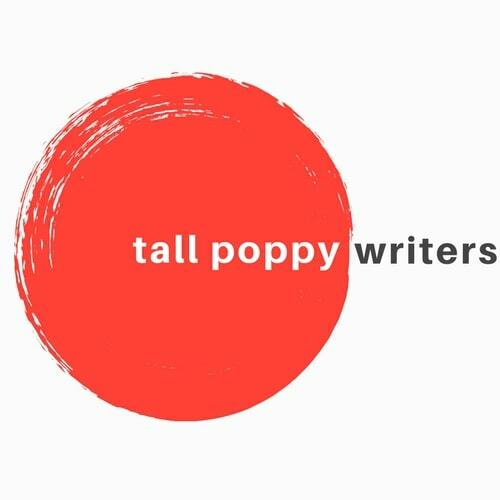 What is the biggest challenge you face when writing mystery/suspense? The biggest challenge in writing mystery/suspense is to know if it’s truly suspenseful. As I always say, the suspense is over for me—I know how it turns out! I listen to music when I write and when I’m working on a particularly suspenseful scene I’ll make sure that the soundtrack matches that intensity. I’ve got a vivid imagination and am easily scared, so channeling my characters’ dread, fear, or anxiety is fairly easy, but making sure that I’m conveying that suspense to readers is harder to gauge and I’m always thrilled when readers tell me that it worked. Thanks so much for joining us Rebecca and we can’t wait to get our hands on JUST BETWEEN US! You can follow Rebecca on Twitter, Facebook, and Instagram, too! 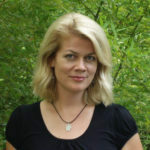 Rebecca Drake is the author of suspense novels JUST BETWEEN US, ONLY EVER YOU, DON’T BE AFRAID, THE NEXT KILLING, and THE DEAD PLACE, as well as the short story, Loaded, which was featured in PITTSBURGH NOIR. She is a Penn State grad and an instructor in Seton Hill University’s Writing Popular Fiction M.F.A. program. A native New Yorker, Rebecca has also lived in Indiana, Ohio, Maryland, Virginia, New Jersey and Qatar and currently lives in Pittsburgh, PA with her husband and two children.